It seems like there are only hours before Thanksgiving but thank goodness we have a little more time than that to put together a memorable day! The menu and cooking takes up so much time, but make sure you add in a few unique items to really set the mood. Hope these help inspire! 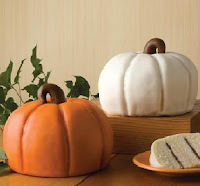 These layered cakes shaped like pumpkins are so beautiful! you can buy them (though very pricey) at www.deandeluca.com. I think you could make this with a little patience... stack cake to make the initial shape, ice coat, then fondant, then press in the pumpkin "lines" and finish with a stem... we'll see if they can fit in my baking schedule!